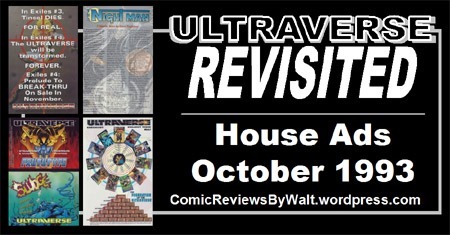 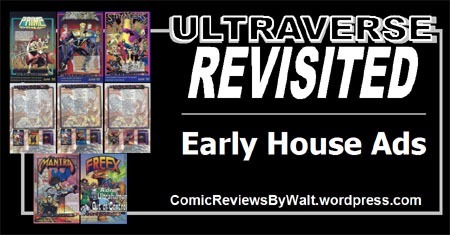 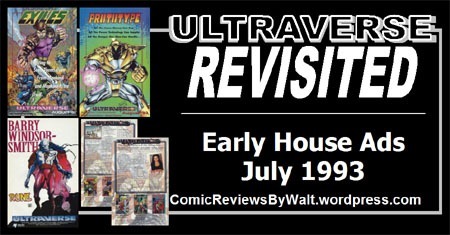 Here are house ads from the second month of the Ultraverse line: July 1993! 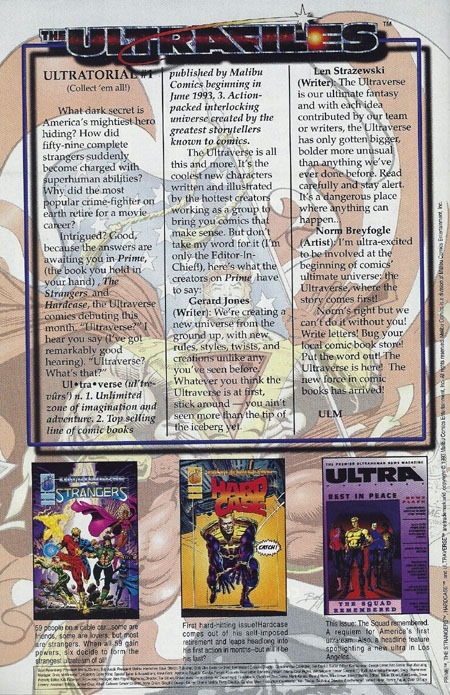 We have two with dates, one without…and then the "Ultrafiles" pages which were all the same this month across all five titles. 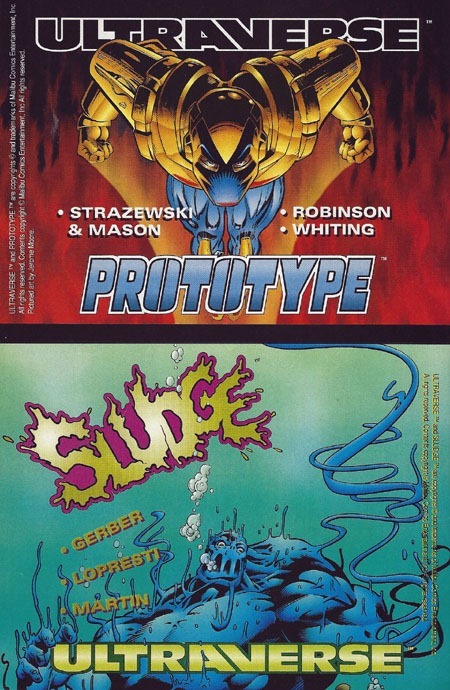 I’m pretty sure that this one for Prototype is my favorite of the month’s ads. 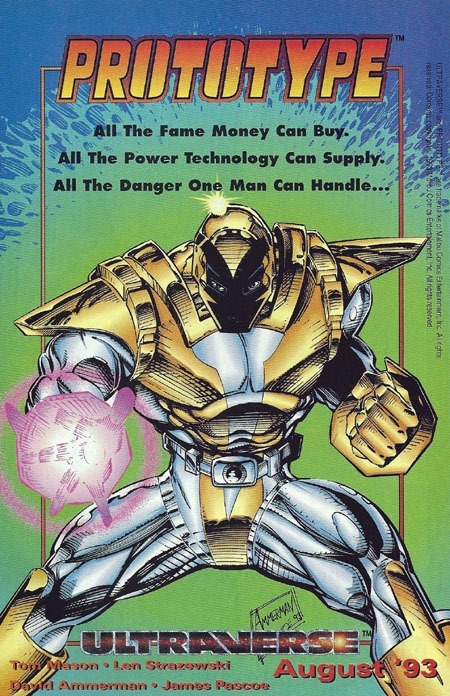 There’s just something to the design of the armor that I really like, and I swear this scanned image doesn’t do the print version justice…there’s just something I really like about the coloring. 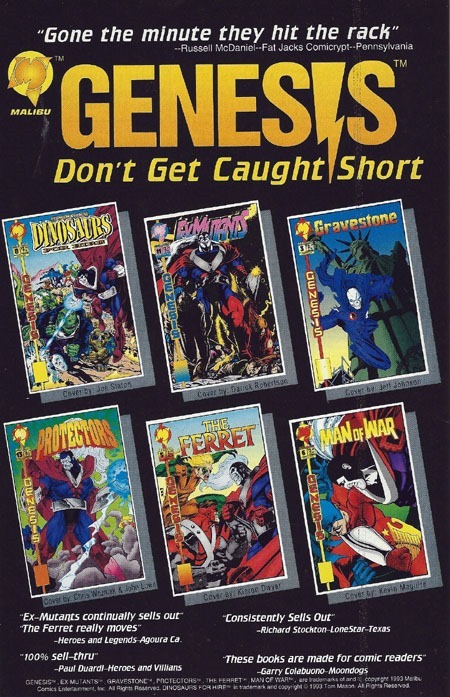 And as with many ads for comics, I really, really like the fact that the promo image basically IS the cover of the first issue. 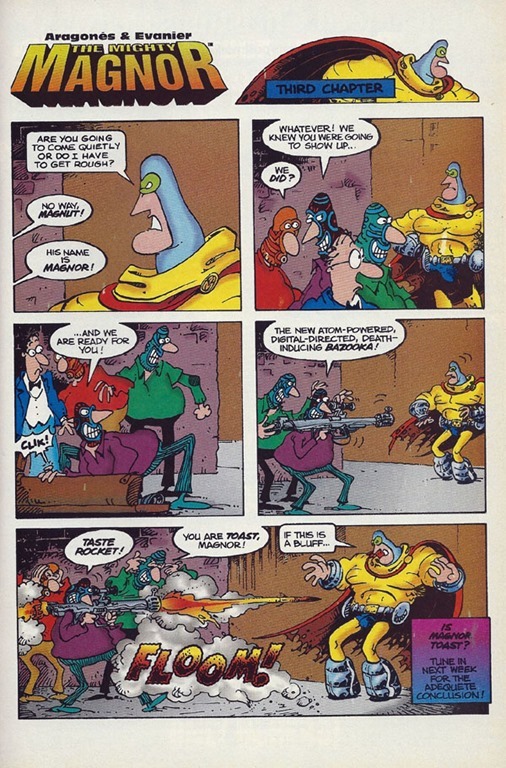 This shows us the character, as well as the image to look for to get the actual comic itself! 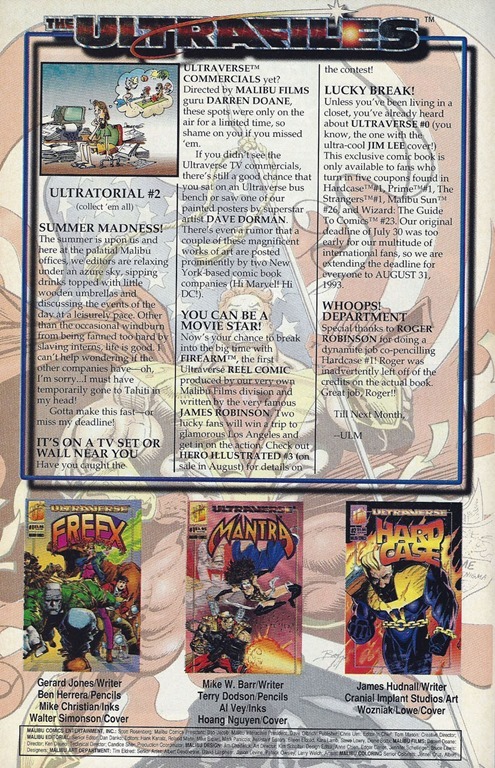 Helpful as the "text boxes" may have been on the first round of ads, I find the "tagline" format to be more effective here, making the ad more of a poster image than something in a pamphlet. 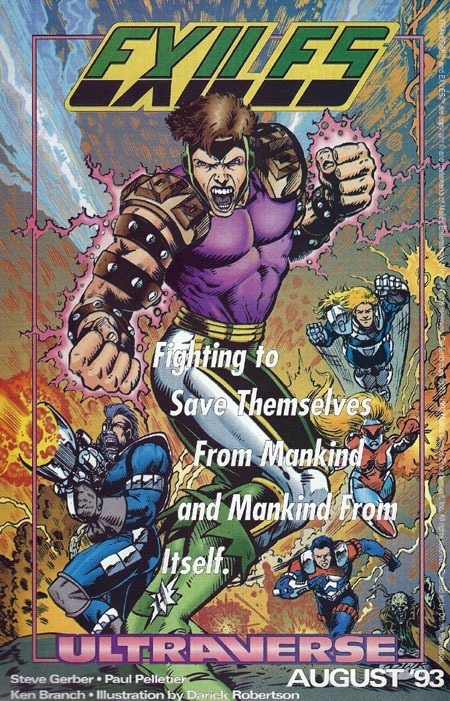 Fighting to Save Themselves From Mankind and Mankind From Itself. 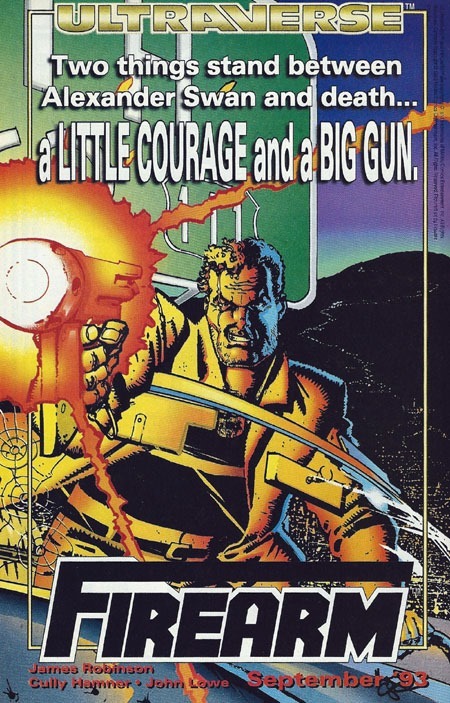 Another large-font, central sort of tagline for a new title. 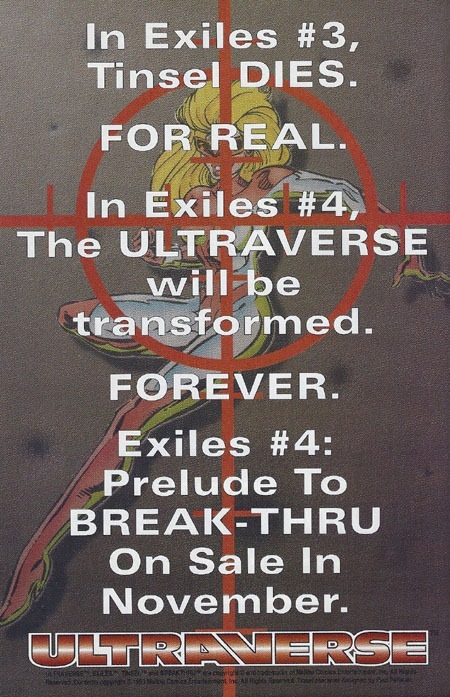 Exiles gave us another super-team (seemed the Ultraverse was full of those!) 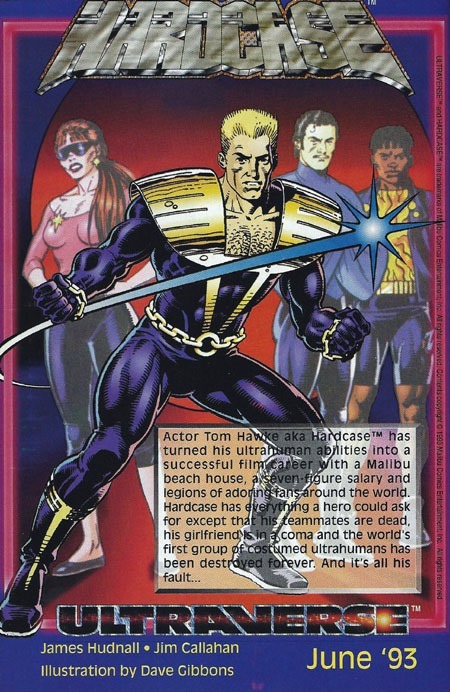 and definitely has a very ’90s look from the ad. 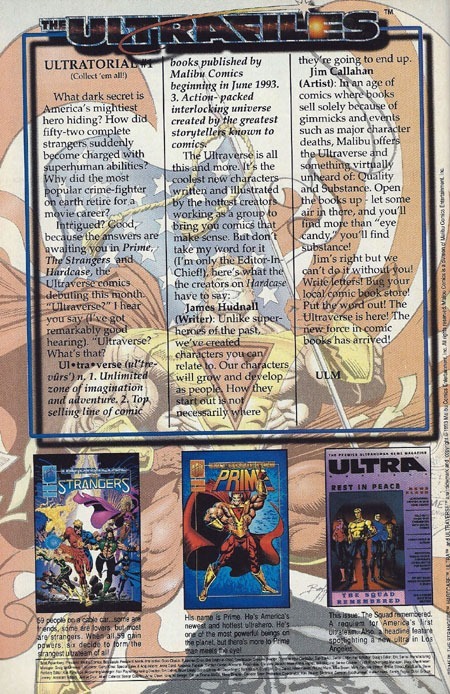 Lacking both tagline AND text box, we have this add with some character and the small Rune logo serving almost as a signature, with the large-text format of Barry Windsor-Smith. 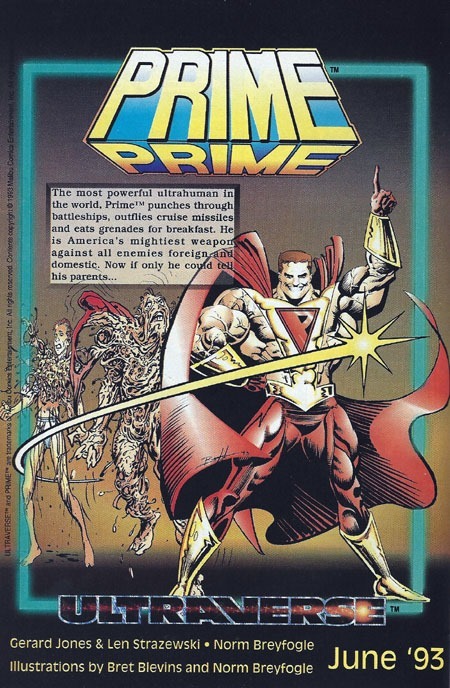 This also lacked any date. 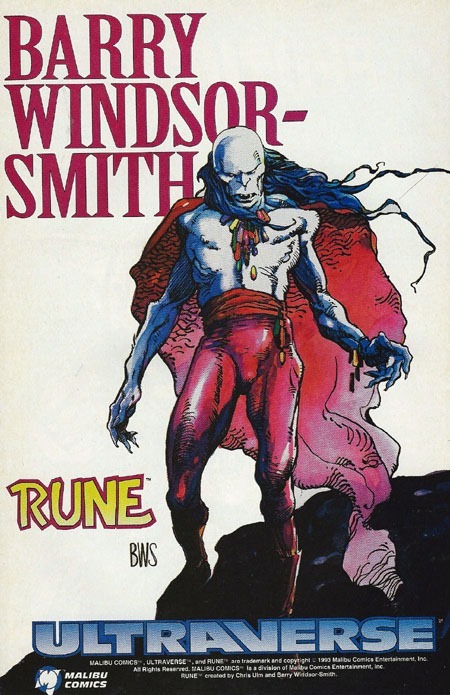 So we had this image of something called Rune, associated with BWS, and based on other ads, one would only assume this was another title or such "coming soon." 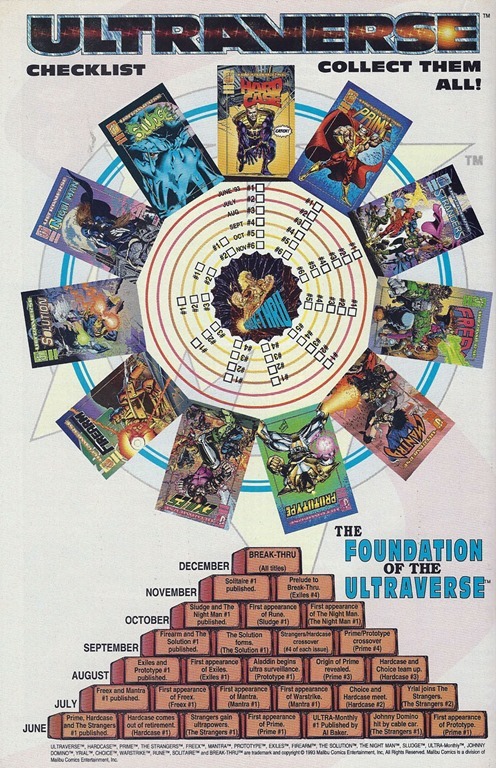 Of course, years later, it’s interesting to look back on it, especially knowing that October 1993 became "Rune Month" with a 3-page story-chunk as flipbooks to the month’s issues, that collectively made up the contents to a Rune #0 issue, with coupons to send away for the standalone #0 issue as its own thing. 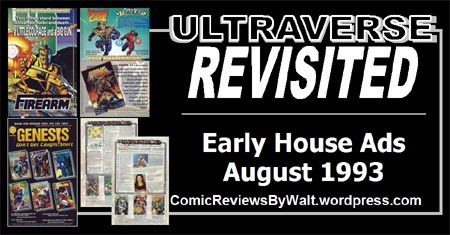 But more on that in posts to come, as the house ads get closer to the ‘event’ itself. 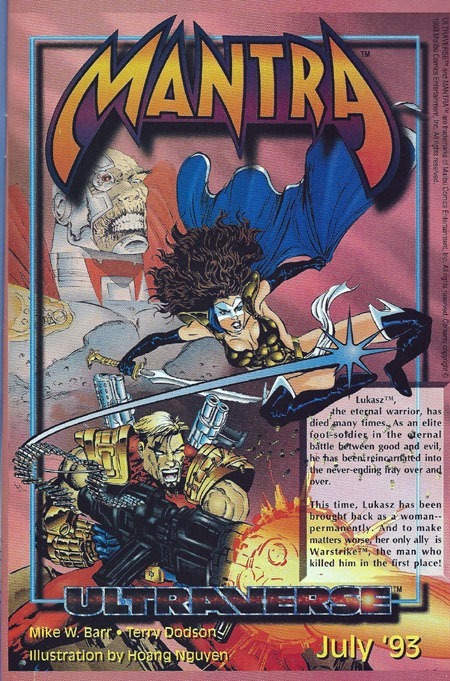 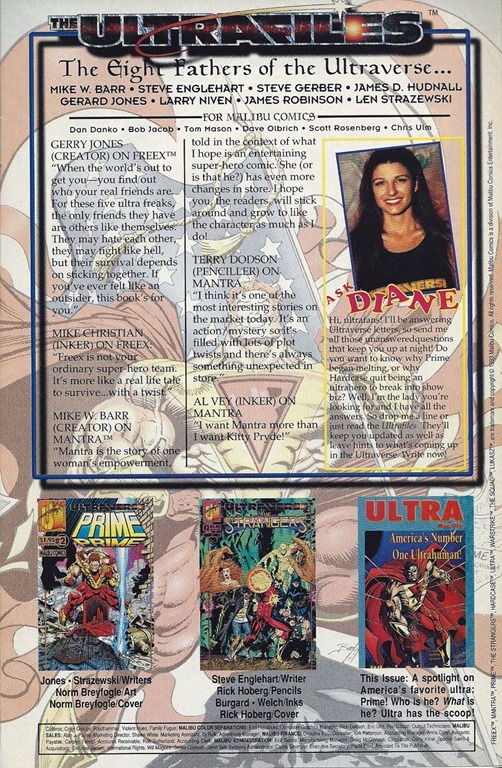 Where text was swapped out for the Ultrafiles pages to make them unique to each title in the June 1993 issues, for July 1993 they seemed to all be exactly the same, and show all 5 titles out for Ultraverse month #2. 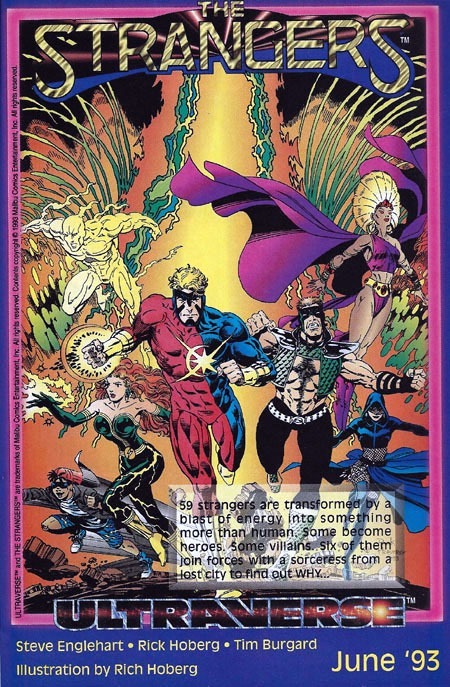 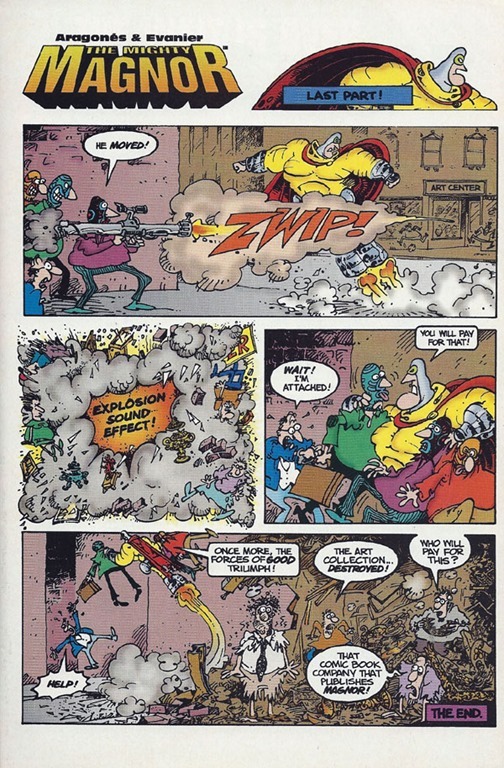 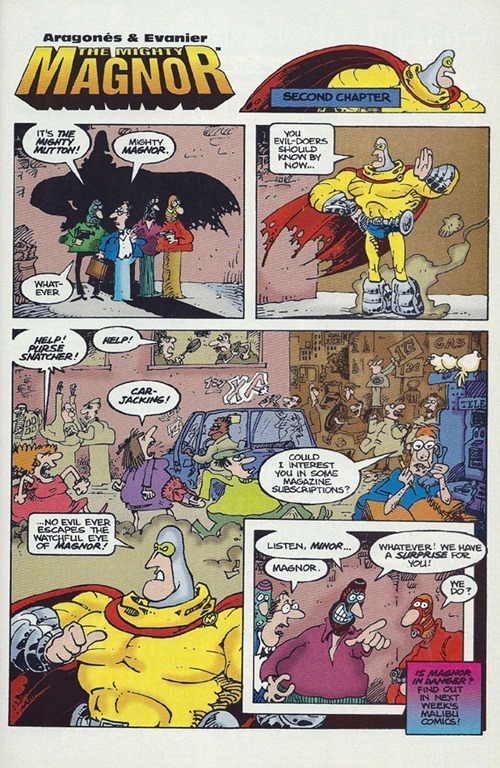 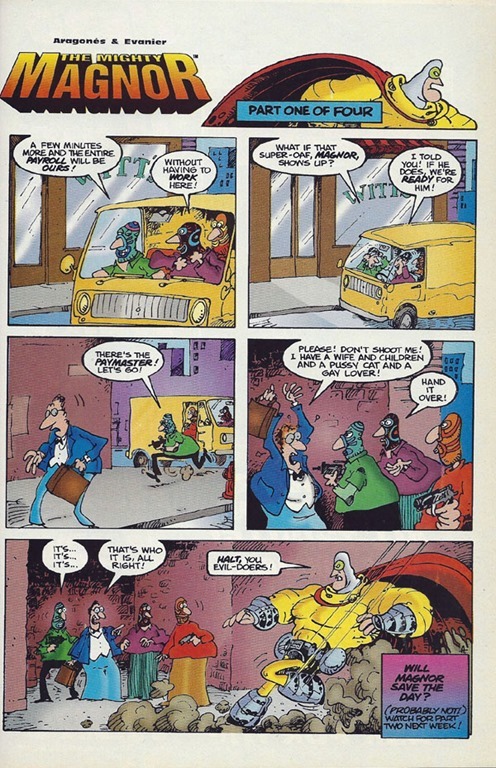 The first page (above) is the "Ultratorial #2." 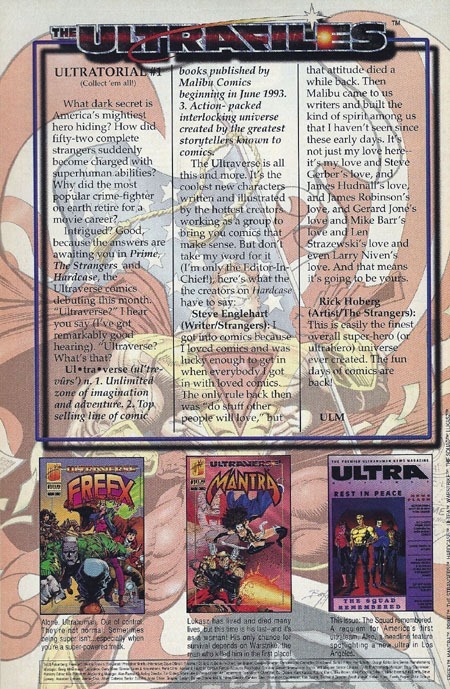 …while the second Ultrafiles page has quick quotes from the creators on the two new additions to the line: Freex and Mantra. 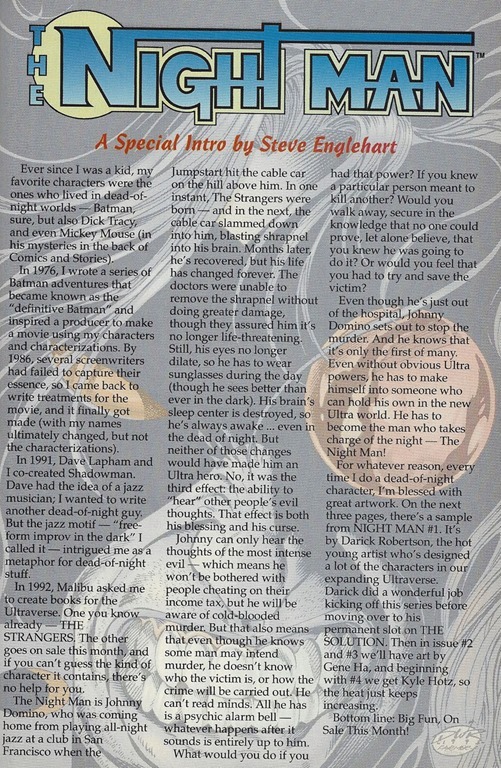 I really like these pages as a common piece across all titles, as well as the "checklist" of showing the covers of the month’s issues. 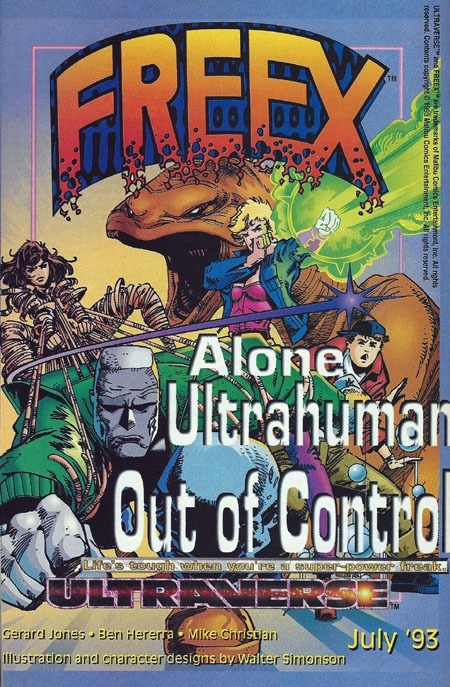 And again, this was a time when the vast majority of comics DID only have one cover…or the "variant" was some sort of spot-coloring or foil in place of color or the presence or not of a UPC box. 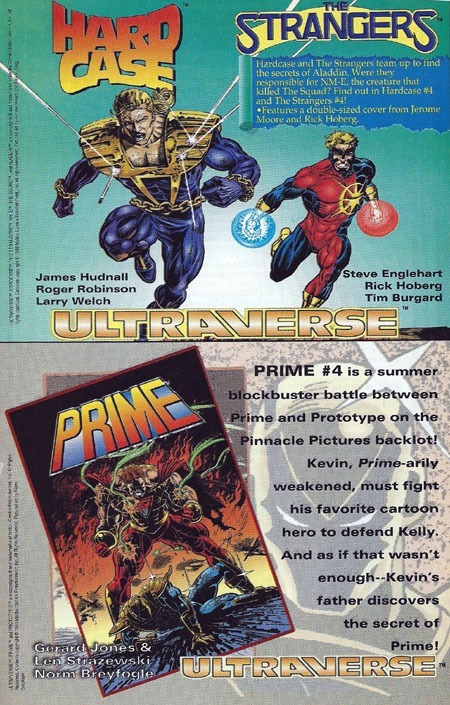 Not completely different art pieces! 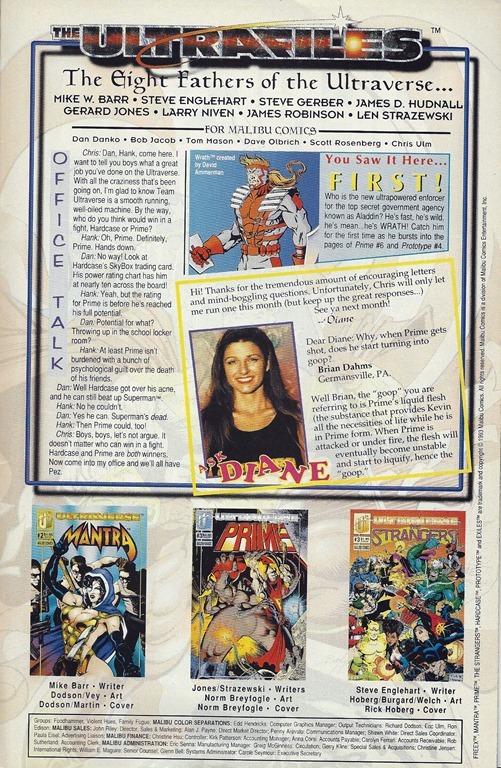 Essentially, the issues thus showed off all of the current month’s titles, plus most of the issues had full-page ads for the next month’s new series’ debuts. 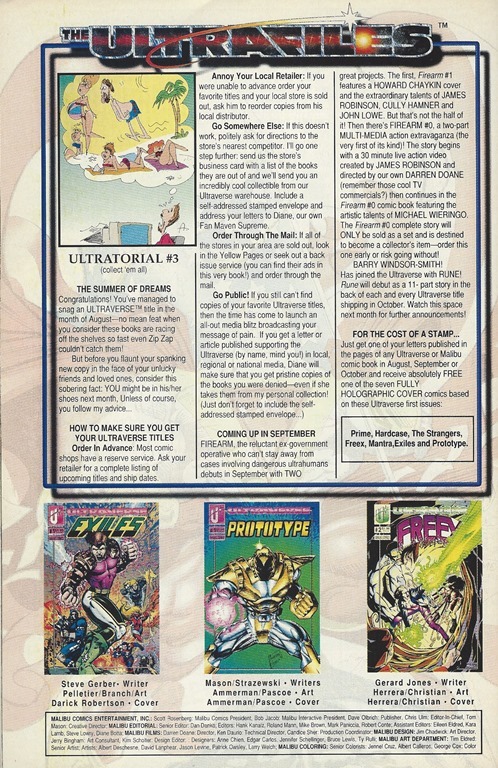 One would not even need the internet or such to know what they’re looking for in shops; one has what one needs from the actual single issue…NO "homework" required.